Now You Can Eliminate Costly Tear-Off and Membrane Replacement For Flat Roofs or Low-Sloped Roofs! With UNIFLEX® You’ll Have A Seamless, Self-Flashing, Bright White Finish Which Protects Against Damaging UV Rays, Reduces Energy Costs & Eliminates Costly Membrane Replacement! Arguably, the most innovative design enhancement in roofing systems was the introduction of the single-ply roofing membranes. Successful in Europe for many years, the systems were first introduced in the United States in the 1970’s. Over the past thirty years, a number of different membranes have been successfully introduced including EPDM, TPO, Hypalon, CPE and PVC to name a few. These membranes have performed well but, as with all building materials, will require maintenance at some point in the life of the system. Many of these membranes, installed in the later 70’s and 80’s are now out of warranty. Several have developed problems such as UV attacking the surface causing chalking, crazing and cracking. Seams and flashings have weakened and become loose causing water infiltration. What options does a building owner have? Since the single-ply systems are relatively new compared to conventional built-up and metal roofing systems, the restoration solution has only been recently addressed. Do you proceed with expensive tear-off and replacement? Can a new membrane be installed over the existing one? What about weight load? Cost of new installation? Conditions of existing insulation and deck? A possible alternative solution is to apply a coating system designed to protect the existing membrane and extend its service life. Not just any roof coating can be applied to weathered single-plies. UNIFLEX has developed a unique coating system designed to be applied to provide excellent adhesion to UNIFLEX approved membranes. The Duro-Last vinyl roof membrane is a proprietary thermoplastic formulation consisting of PVC resins, plasticizers, stabilizers, biocides, flame retardants and U.V. absorbents. A weft-insertion knitted scrim that is laminated between two layers of PVC film gives the membrane its strength and durability. 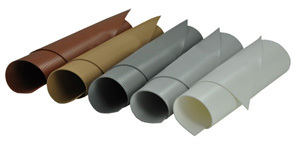 The Duro-Last single-ply membrane is available in white, gray, dark gray, tan, or terra cotta. Duro-Last has met or exceeded all major fire and wind code requirements, and regional approvals as necessary throughout the country. These certifications reinforce Duro-Last’s leadership in providing the consistent, watertight integrity that building owners expect. Duro-Last has been approved by Factory Mutual as a 1-60,1-75, 1-90, 1-95, 1-105, 1-135, 1-150, 1-165, 1-195, 1-210, 1-270, 1-435, and 1-495 roofing system. Duro-Last is also listed by Underwriters Laboratories as a Class A, B, & C approved material. Evaluation services ICBO and NES have merged to form ICC-ES, which has evaluated Duro-Last for the International Building Code (IBC). The Duro-Last roofing system has been approved by the IBC and by code agency MIAMI-DADE for use in their respective jurisdictions. Duro-Last is proud to be a charter partner of the ENERGY STAR® Roof Products Program. The ENERGY STAR label indicates to building owners and managers that the Duro-Last white vinyl roof membrane can save them money on cooling costs due to its high reflectivity (reflects 88% of the sun’s energy). Duro-Last is also a charter member of the Cool Roof Rating Council (CRRC) and a member of the United States Green Building Council (USGBC). Duro-Last participates in all major technical committees in the roofing industry, plus the American Society of Testing Materials (ASTM). The Duro-Last single-ply flat roofing system is ideal for any low sloped or flat roof design. Since 1978, over a billion square feet of Duro-Last membrane have been installed on buildings of all types. Duro-Last is Energy efficient. The Duro-Last white membrane has the highest retained reflectivity of any single-ply memnbrane rated by the EPA’s ENERGY STAR® Roof Products Program, saving significant energy and money for facilities with low-sloped and flat roofs throughout North America. Duro-Last is Durable. The Duro-Last roofing system is resistant to fire, chemicals, grease, high winds, and punctures, and easily accommodates wide temperature extremes. A Duro-Last installation on your building’s low-sloped or flat roof is quiet and safe, without loud machinery, hazardous materials, noxious fumes, hot tar or mess. A new Duro-Last roofing system often can be installed over an existing roof without an expensive tear-off. Backed by the industry’s best warranties for low-sloped or flat roofs. Duro-Last protects the commercial and industrial building owner with either a 15-year full warranty or a 20-year prorated warranty. Both warranties are transferable, and both provide maximum protection. Our standard warranty includes coverage for consequential damages that result from defects in the Duro-Last material and/or installation. Leave that kettle in the yard, leave that torch in the shop… no need to hire a kettle man. For low-slope or steeper slopes when a fast, clean, insurance friendly application is desired. Commercial grade systems you can trust due to new generation adhesive and Adeso® “dual compound” technology. Years of field-proven performance. Instant bonding roll-to-roll with enhanced sealability due to SEALLap® selvage treatment. More reliable seams, fast end laps due to granule-free FASTLap®. Elevator portability for high-rise building jobs. Can be temporarily left exposed – creates watertight roof for projects that must be completed in stages. Available in standard and Fire Rated sheets. Specially designed for use in applications requiring a nailable base sheet. Granualted SA-SBS Cap Sheet available in 11 standard colors: buff, oak, weatherwood, black, chestnut, grey slate, pine green, and red blend. Also available in 2 special order colors: green (solid, no blend), and red (solid, no blend). Standard and Fire Rated sheets. Granualted SA-APP Cap Sheet available in 11 standard colors: buff, oak, weatherwood, black, chestnut, grey slate, pine green, and red blend. Also available in 2 special order colors: green (solid, no blend), and red (solid, no blend). Did you know that 99% of all roofing material components can be recycled? Simply put, there's no good reason why all roofing companies shouldn't recycle. We are all inhabitants in our fragile eco-system. Mountain High Roofing tries to lead by example. As a responsible inhabitant, Mountain High Roofing recycles as much of the old roofing components that it removes from old roofs as possible prior to new roof installations.